Habib Bokhari is currently serving as Professor of Microbiology & Immunology at Department of Biosciences at Islamabad Campus. He has served CIIT for more than 14 years now. 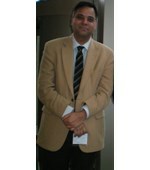 In fact, he was the first PhD faculty member hired by CIIT in Biosciences in 2002-2003. He is responsible for starting a teaching/research program in the then brand new field of Bioinformatics in Pakistan. He has done 4 Postdocs from well reputed Universities such as Perelman School of Medicine, UPENN, USA and London School of Hygiene & Tropical Medicine, UK. He is a recipient of Commonwealth Scholarship and Fellowship (199-2002; 2013) and Fulbright Fellowship (2016-2017). He has number of active, national and international collaborations with world’s best Universities such as, National University of Singapore, London School of Hygiene & Tropical Medicine, RVIM The Netherlands, George Mason University, USA, Department of Biomedical Engineering Florida International University, Sanger Centre, Hinxton, UK and UPENN, USA. Bostan Nazish,--,--''Dengue Fever Virus in Pakistan: Effects of seasonal Pattern and Temperature change on Distribution of Vector and Virus'',Reviews in Med. Virology ,2016. Nighat Noureen,--,--''In silico identification of receptor specific epitopes as potential vaccine candidates from Vibrio cholerae strains'',Gene Reports ,2016. Claudio Angione,--,--''Bioinformatics challenges and potentialities in studying extreme environments '',Lecture Notes in Bioinformatics ,2016. Mahwish Younas,--,--''Characterization of enteropathogenic Escherichia coli of clinical origin from pediatric population in Pakistan'',Trans. Royal Soc of Trop. Med. Hyg,2016. Umair Manzoor,--,--''Antibacterial, Structural and Optical Characterization of Mechano-Chemically Prepared ZnO Nanoparticles'',PLOS ONE,2016. Uzma Khalil,--,--''Phenotypic and Genotypic Characterization of Enteroaggregative Escherichia coli Isolates from Pediatric Population in Pakistan'',APMIS,2016. Fiza Rana,--,--''Resistance patterns of diversified phylogroups of Escherichia coli associated with mothers having history of preterm births in Pakistan'',The Journal of Maternal-Fetal & Neonatal Medicine,2016. Bushra Jamil,--,--''Bacteremia: Prevalence and antimicrobial resistance profiling in chronic kidney diseases and renal transplant patients'',JPMA,2016. Hanif N,--,--''Geo-accumulation and enrichment of trace metals in sediments and their associated risks in the Chenab river, Pakistan'',Journal of Geochemical Exploration,2016. Muhammad Ali Syed,--,--''SPR immunosensorfor the detection of Staphylococcus aureus'',IEEE,2016. Bushra Jamil,--,--''Cefazolin loaded chitosan nanoparticles to cure multi drug resistant pathogens '',Carbohydrate Polymers ,2016. Bushra Jamil,--,--''Mechanism of action: How Nano-antimicrobials act?. '',Current Drug Targets,2016. Noreen Zobia,--,--''Antibiotic Susceptibility and Molecular Characterization of Campylobacter jejuni Strain Isolated from a Child with Guillain Barre Syndrome- First Case Report from Pakistan'',The Indian Journal of Pediatrics,2016. Madiha Shabbir,--,--''Spatial analysis and identification of high risk plague regions in Pakistan based on rodent vector distribution and climate change'',J. Infect. Dis. Develop. Countries ,2016. Muhammad Ali Syed,--,--''Shattering a Myth: Whooping Cough susceptible to antibiotics'',Pakistan Journal of Pharmaceuticals,2016. Muhammad Aqeel Kamran,--,--''Bioaccumulation of nickel by E. sativa and role of plant growth promoting rhizobacteria (PGPRs) under nickel stress'',Ecotoxicology and Environmental Safety,2016. Farah Masood,--,--''Characterization and application of roxithromycin loaded cyclodextrin based nanoparticles for treatment of multidrug resistant bacteria'',Materials Science and Engineering C,2016. Fariha Massod Siddiqui,--,--''Draft Genome Sequence of the Enteropathogenic Bacterium Campylobacter jejuni Strain cj255. '',Genome Announcement ,2015. Bhowmik AK,--,--''Mapping human health risks from exposure to trace metal contamination of drinking water sources in Pakistan '',Journal: Science of the Total Environment,2015. Shahr Bano Mirza,--,--''Exploring Natural Products from the Biodiversity of Pakistan for Computational Drug Discovery Studies: Collection, Optimization, Design and Development of A Chemical Database (ChemDP)'',Current Computer-Aided Drug Design,2015. Muhammad Ali Syed,,''Shattering a Myth: Whooping Cough susceptible to antibiotics'',Pakistan Journal of Pharmaceuticals,2015. Tariq A,,''Is atomic rearrangement of type IV PHA synthases responsible for increased PHA production?. '',Journal of Biomolecular Structure & Dynamics,2015. Fariha Masood Siddiqui,,''Antibiotic Susceptibility profiling and virulence potential of Campylobacter jejuni isolates from different sources in Pakistan'',Asia Pacific Journal of Tropical Medicine,2015. Sundus Javed,,''Bordetella parapertussis outbreak in Bisham, Pakistan in 2009-2010: Fall out of the 9/11 1 syndrome'',Epidemiology & Infection,2015. Fariha Siddiqui,,''Molecular Detection Identified a Type Six Secretion System in Campylobacter jejuni from Various Sources but not from Human Cases'',Journal of Applied Microbiology,2015. Muhammad Rizwan Riaz,,''Structural and Functional Studies of BapC Protein of Bordetella pertussis'',Microbiological Research,2015. M Abdullah,,''Avian feathers as a non-destructive bio-monitoring tool of Toxic Metals Signatures: A case study from severally contaminated areas of Pakistan'',Chemoshpere,2015. Jabir Hussain Syed ,,''Pesticide residues in fruits and vegetables from Pakistan: a review of the occurrence and associated human health risks. '',Environment Sciences and Pollution Research,2014. Saba Asad,,''Detection of Molecular Markers by Comparative Sequence Analysis of Enzymes From Mycobacteria Species'',Pakistan Journal of Botany,2014. James W. Harrison ,Tran Thi Ngoc Dung,Fariha Siddiqui''Emergence of a novel Campylobacter jejuni genotype associated with Chickens and Human Infection in South Asia'',Emerging Infectious Diseases ,2014. Saira Mumtaz,Rashad Hussain,Abdul Rauf''Synthesis, Molecular docking studies, and in vitro screening of barbiturates/thiobarbiturates as antibacterial and cholinesterase inhibitors. '',Medicinal Chemistry Research ,2014. Syed M Shah,Ankur Mutreja,Nick Thomson''Genomic Epidemiology of Vibrio cholerae O1 associated with Floods, Pakistan'',Emerging Infectious Diseases,2014. Mudassar Khan,Syed Ali Musstjab Akber Shah Eqani,Athanasios Katsoyiannis''Cattle egret as a Biosentinels of Persistent Organic Pollutants (POPs) exposures from different areas of Pakistan'',Environ. Geochem & Health ,2014. Idrees,,''Novel fluorescent protein from Hydnophora rigida possesses green emission'',BBRC,2014. Muhammad Imran Khan,,''Homozygosity mapping identifies genetic defects in four consanguineous families with retinal dystrophy from Pakistan'',Clinical Genetics,2013. Bokhari H,,''Escherichia coli pathotypes in Pakistan from consecutive floods in 2010 and 2011'',Am J Trop Med Hyg ,2013. 3. Syed Ali-Musstjab-Akber-Shah Eqania,,''Uptake of organochlorine pesticides (OCPs) and polychlorinated biphenyls (PCBs) by River water fish. The case of River Chenab.'',STOTEN,2013. Muhammad Idrees,,''Sol-Gel immobilization of methyl parathion degrading bacteria isolated from agricultural areas of Pakistan'',Chemistry & Ecology,2013. Bokhari Habib,,''BapC autotransporter protein of Bordetella pertussis is an adhesion factor'',Journal of basic Microbiology,2012. Muhammad Ajmal,,''Identification of recurrent and novel mutations in TULP1 in Pakistani families with early onset retinitis pigmentosa'',Molecular Vision ,2012. A. Mughal,,''Pertussis resurgence among vaccinated children in Khairpur, Sindh, Pakistan'',Public Health ,2012. Syed M. A,,''Seroprevalence of Bordetella pertussis antibodies to Pertussis toxin among healthy children from two cities of Pakistan'',J. col. Phy. Surg,2012. H Bokhari,F. Said,M.A. Syed''Molecular typing of Bordetella parapertussis isolates circulating in Pakistan '',FEMS Immunology & Medical Microbiology,2011. M. A. Syed,A. S. Bhatti,R. Guduru''Use of SPR biosensor for the study of proteolytic action of a serine protease enzyme '',American Journal of Biomedical Sciences,2011. H. Bokhari,H. Bilal ,M. Anwer ''Evidences of lateral gene transfer between Archaea and pathogenic bacterial genomes '',Bioinformation,2011. Asif Raza,Hira Shareef,Hira Salim''Selection of predicted siRNA as potential antiviral therapeutic agent against influenza virus '',Bioinformation,2011. Sadia Zafar,Arshan Nasir,Habib Bokhari''Computational analysis reveals abundance of potential glycoproteins in Archaea, Bacteria and Eukarya'',Bioinformation,2011. Mojtaba Noofeli,Habib Bokhari,Paul Blackburn''BapC autotransporter protein is a virulence determinant of Bordetella pertussis'',Microbial Pathogenesis,2011. Syed Tabish,Abbas Raza,Arshan Nasir''Analysis of glycosylation patterns and glycosyltransferases in Bacteria and Archaea '',Bioinformation,2011. Idrees M,Mussarat U,Badshah Y''Prevalence of antimicrobial resistance and integrons in uropathogenic Escherichia coli, from Punjab, Pakistan '',Brazilian Journal of Microbiology ,2011. H. Bokhari,F. Said,M.A. Syed''Whooping cough in Pakistan: Bordetella pertussis vs Bordetella parapertussis in 2005 – 2009 '',Scandinavian journal of infectious diseases ,2011. Ashfaq Mahmood1,,''Antimicrobial efficacy of metal-barbiturate conjugates against pathogenic strains of Escherichia coli and Staphylococcus aureus'',Letters in Drug Design & Discovery,2011. Bokhari Habib,Zafar Sadia ,Bilal Iram''BORDETELLA AUTOTRANSPORTER PROTEIN C IS AN ADHESION FACTOR FOR BORDETELLA PERTUSSIS. '',Journal of basic Microbiology ,2011. Maleeha Azam,Rob W.J.Collin,Ayesha Malik''Identification of novel mutations in Pakistani families with autosomal recessive retinitis pigmentosa '',Archives of Ophthalmology ,2011. Syed M. A ,Bukhari S. H. A,''Gold nanoparticle based microbial detection and identification'',J. Biomed. Nanotechnol,2011. Muhammad Idrees,Muhammad Ali Shah, Raheel Qamar ''Antimicrobial Resistant Escherichia coli Strains Isolated from Food Animals in Pakistan'',Pakistan Journal of Zoology,2011. H. Bokhari,C. Smith ,K. Veerendra ''Novel Fluorescent Proteins From Hydnophora Rigida Possess Cyano emission'',Biochemical and Biophysical Research Communications ,2010. Amna Salman,Atefeh Taherian Fard,Arshan Nasir ''Comparative analysis of organophosphate degrading enzymes from diverse species'',Bioinformation ,2010. Muhammad Ali Syed,Umair Manzoor,Ismat Shah ''Antibacterial effects of Tungsten nanoparticles on the Escherichia coli strains isolated from catheterized urinary tract infection (UTI) cases and Staphylococcus aureus'',New Microbiologica,2010. Idrees M,Mussarat U,Badshah Y''Virulence factors profile of drug resistant Escherichia coli isolated from urinary tract infections, in Punjab, Pakistan '',European Journal of Clinical Microbiology & Infectious Diseases,2010. Muhammad Ali Syed,Syed Habib Ali Bukhari,''Adult and adolescent pertussis should not be underestimated'',Pak J Med Sci. ,2010. Taimoor Hashmi,Shakil Khan,Valeed''In silico identification of vaccine candidates against enteric pathogens by comparative genome sequence'',Asian Pacific Journal of Molecular Biology and Biotechnology,2010. Muhammad Ajmal,Waqas Ahmed,Ahmed Sadeque''Identification of a recurrent insertion mutation in the LDLR gene in a Pakistani family with autosomal dominant hypercholesterolemia'',Molecular Biology Reports,2010. Muhammad Ali Syed,Shaista Babar,A. S. Bhatti''Antibacterial effects of silver nanoparticles on the bacterial strains isolated from catheterized urinary tract infection cases'',Journal of Biomedical Nanotechnology,2009. Muhammad Ali Syed,Fahad Said,S. Habib Ali Bukhari''Seroepidemiology of Bordetella pertussis infections in the twin cities of Pakistan'',North Am J Med Sci,2009. Atefeh Taherian Fard,Amna Salman,Bahram Kazemi ''In silico comparative genome analysis of malaria parasite Plasmodium falciparum and Plasmodium vivax chromosome 4'',Parasitology Research,2009. Maleeha Azam,Muhammad Imran Khan,Alamdar Hussain''A homozygous p.Glu150Lys mutation in the opsin gene of two Pakistani families with autosomal recessive retinitis pigmentosa'',Molecular Vision,2009. Siddiqa A.,Niazi M.,Mustafa F''A new hybrid agent-based modeling & simulation decision support system for breast cancer data analysis. '',Proc Information and Communication Technologies ICICT '09 International Conference ,2009. S. Habib Bokhari ,P. Blackburn,''Purification and protective efficacy of re-natured C-terminal domain (P.30) of pertactin autotransporter protein of B. pertussis'',Pak. J. Bot ,2008. S. Habib Bokhari ,P. Blackburn,''Pertactin processing and secretion in protease(s) deficient strains of Escherichia coli suggestive of the possible role of proteases in folding of autotransporter proteins'',Pak. J. Bot ,2008. Shahid Mahmood Baig,Ayesha Azhar,Habib Bokhari''Spectrum of beta-thalassemia mutations in various regions of Punjab and Islamabad, Pakistan: establishment of prenatal diagnosis'',Haematologica/The hematology journal (IF=6.416),2006. S. M. Baig,F. Rabbi,S.H. Bokhari''Molecular characterization of mutations causing ß-thalassemia in Faisalabad Pakistan using the amplification refractory mutation system (ARMS-PCR)'',Ind. J. Hum. Gen,2005.